The TJ4200 TopJet Attic Air Inlet is a gravity ceiling vent with a revolutionary, patented design that maximizes air management. 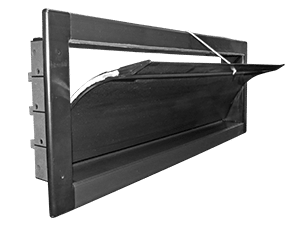 Double L's gravity-operated TJ4200 TopJet Ceiling Inlet is designed to provide birds with a better mix of air and to help growers maintain higher ventilation rates during cold weather without sacrificing poultry house temperatures or wasting fuel. Attic inlets can significantly reduce poultry house fuel usage and improve poultry house ventilation system management. Even more significant is the improved house air quality and litter conditions during cold weather. Between flocks, TJ4200 Attic Inlets can be used to help dry out damp litter as well as to help "cook" off some of the ammonia from the litter. By closing up the poultry house and turning on a couple of 36" stir fans during the day, attic inlets can increase the house temperatures from 10 to 15 degrees above outside air temperatures. Ventilating a house with hot, dry air between flocks will help to ensure the litter is dry and the ammonia levels are low when the next flock of chicks is placed. 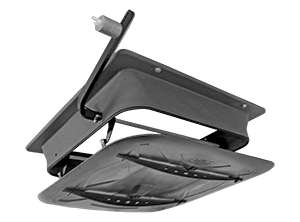 The all-season, 4-Way TJ4200 attic poultry inlet features counterbalance louvers that open from the TOP instead of the bottom. The TJ4200 TopJet Gravity inlet pulls warm attic air into the house and directs the air along the ceiling. Unlike traditional ceiling inlets which force cold air directly towards the floor, the TJ4200 gravity operated ceiling inlets mix warm tempered air from the attic with house air along the ceiling of the poultry house for better mixing and to reduce downdrafts on birds. The TJ4200 Vent holds the air current up longer thereby mixing with room air and distributing fresh air even more evenly while minimizing or eliminating bird stress. The TJ4200 TopJet Ceiling Inlets supplement poultry house sidewall inlets with an automatic supply of tempered air during the early stages of minimum ventilation, without the need for a winch. 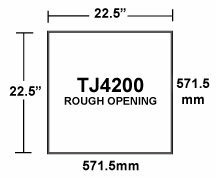 The TJ4200 Inlets are simple to assemble and require no tools. Simply snap three sides together, insert the bottom channel and snap the fourth side in place to complete the inlet. The unique packaging also serves as the attic sleeve during installation. The above video discusses the many advantages of the TJ4200 TopJet Ceiling Inlet. The metal roof and the attic of a poultry house act as a giant solar collector. Attic temperatures range between five and thirty degrees above outside air. This is basically a free source of heat, that was wasted energy in the past. With the TopJet Attic inlet you are able to use this abundant source of free heat and distribute it throughout your poultry house. The TJ4200 is specifically designed to work with the poultry house's minimum ventilation fans, to collect this valuable source of heat. When the fans turn on, the attic inlets open. The drier, warmer attic air is distributed evenly in four directions, minimizing harmful drafts. When the ventilation fans shut-off, the TJ4200 gravity inlet closes. 360 degree airflow with heavy-duty radius corner design increases fuel savings, air distribution, and air mixing. Aerodynamic, curved louver blade directs fresh air along the ceiling to the ceiling peak for effective air mixing and speeds air to the center of even wider poultry houses.